Dog News Heroic Dogs Rescue Rescue Video Video Viral Video Wow! The video of the dog trying to help, or rather, steal his brother’s stick, is actually amusing once you see that there’s not a massive waterfall just downstream. A video of a dog “saving” another dog from some fast-moving water is making waves on the internet, and it’s stirring up conflicting points of view. The dogs’ owner and video recorder is getting a lot of flak for filming instead of helping. The thing is, after the torrent is a small, calm pool, much like one would find at the end of a water slide, so there’s really not that much danger. It’s not at all surprising that this video is stirring up a lot of controversy, because you can’t see the pool at the end, so it looks much scarier than it is. When you can’t see the whole picture, it’s easy to make assumptions. Recently, a video was leaked online from the filming of the movie A Dog’s Purpose which showed a trainer trying to force a German shepherd into a pool of water set up to simulate a fast current, and the dog was clearly terrified. It’s made a LOT of trouble for that film, and really, it’s not at all hard to understand why people had such an issue, given how the entire scenario was presented. However, the team members responsible for the creation of this film are devoted animal lovers, and were just as horrified by the shot of that take as everyone else who saw it. Producer Gavin Polone gave a thorough explanation of the situation, answering many questions, and also raising some, namely, why the person who secretly filmed the video waited over a year to release it if they were so concerned about animal welfare. This situation is similar, because in both it seems that a human is doing something that he knows will cause distress to a dog, but persists anyway to get a good shot. The area where the dog went into the water was just slightly upstream from a part of the river that widens and slows down significantly. Owner Rafael Francuilli is reported to take the dogs there frequently to play, so it’s not nearly as hazardous as it looks in this close-up video. He alleges that the dog just lost his footing, causing him to tumble down the water flow awkwardly. 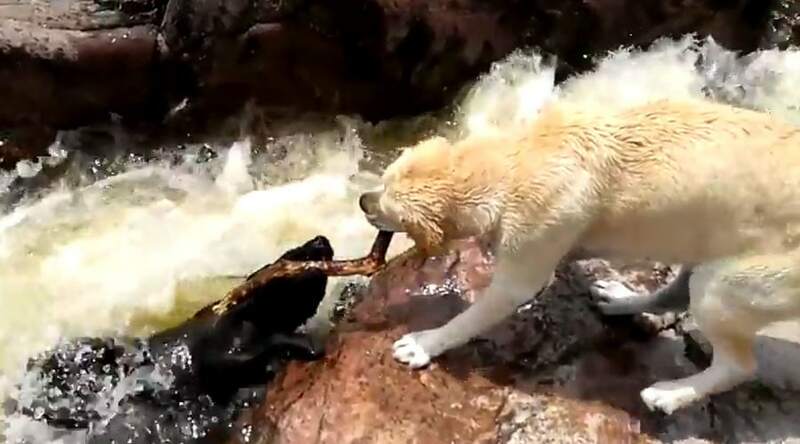 The video of this dog trying to help, or rather, take advantage of his brother’s peril to steal his stick, is actually amusing once you see that there’s not a massive waterfall just downstream. However, we will say that playing fetch on top of even a little torrent like that is risky, as the dog could have easily been injured by the stick or rocks. For anyone who wants to cry abuse, this is what the water looks like just past the current. Just like a water slide.